The kids and I love making DIY Valentine’s Day cards to give to their classmates. 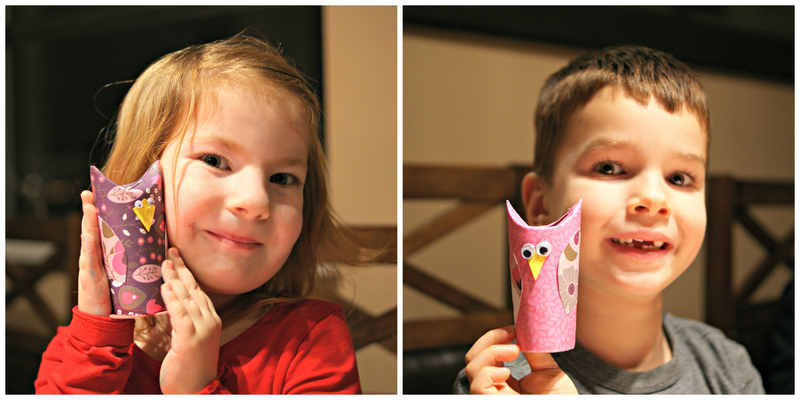 We’ve made super cute personalized cards and now these adorable owls will make up this years toilet roll Valentine’s Day craft. The big kid has been stock piling empty toilet paper rolls, insisting that we make something fun with them. 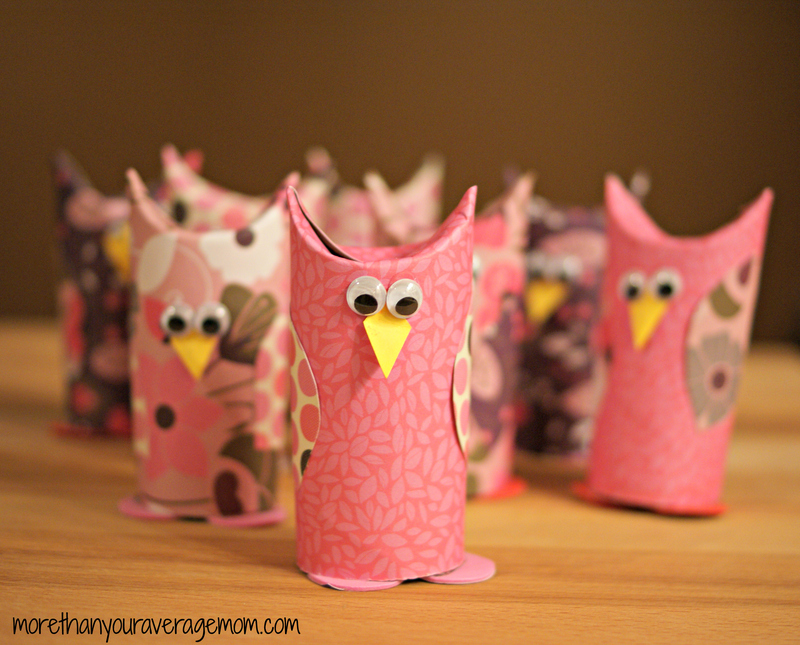 In the interest of cute valentines day crafts, and de-cluttering my bathroom, we’ve settled on these owls as the perfect toilet paper roll Valentine’s Day craft! 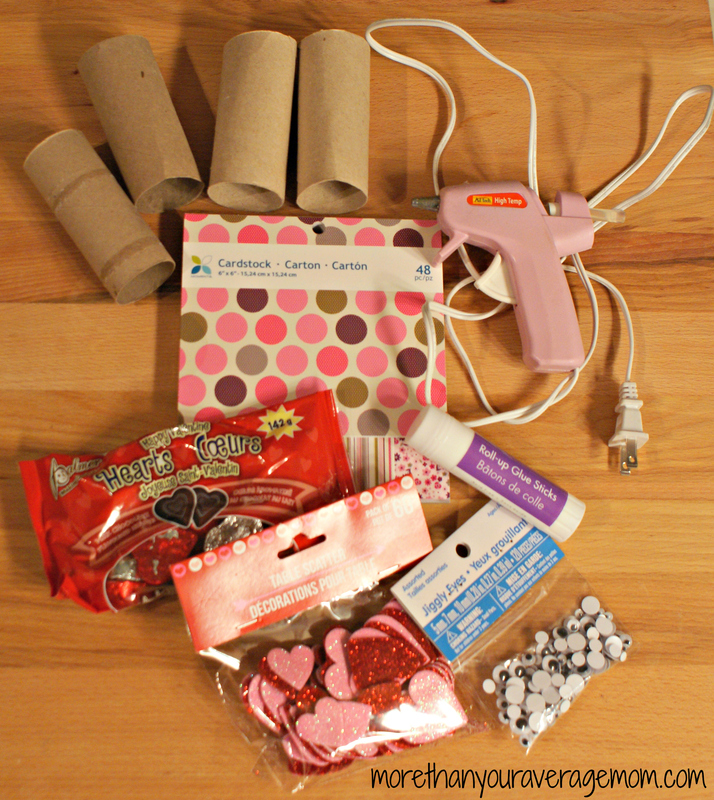 The best part about this toilet roll Valentine’s Day craft is that you likely have all the required supplies at home already. However, if you don’t a quick trip to Michaels, Walmart, or even your local Dollar Store will inexpensively yield you all that you need for this fun project. We opted to cover our toilet rolls with Valentine’s Day themed craft paper, however the versatility of this craft allows the toilet rolls to be painted, colored with markers, or even wrapped with fabric or bits of scrap paper for a fun and textured look! To get started, plug your glue gun in and get it warmed up. Next, measure your toilet rolls to see how much scrapbook paper you need to cover (make sure you have a little overlap). Mine worked out to be 4″ x 6″ which was great as I just had to cut a 2″ strip off which I later used for the owl’s wings. Using your glue stick, glue the entire back of the scrapbook paper and then carefully line it up with the edge of the toilet roll. Make sure you hold the seam down for a few extra seconds to ensure that it is fully secure. I started by taping them down, but found it to be unnecessary. Once your owl bodies are glued, use the 2″ leftover strip to make the owls wings. Fold the strip in half, and then cut it at the half way point. You will now have two small squares, and one wider square folded in half. Cut the folded piece and then you will have 4 squares to make 2 sets of wings. Cut a leaf like shape out of the pieces to make your wing. Using your glue stick, glue contrasting/coordinating wing pieces on either side of the owl, keeping the seam to the back of your owl. Hold the sides down to ensure they’re stuck on good. Next, cut a small kite shape out of yellow card stock for the beak. Gently fold the beak in half at the points creating some definition for a 3D look. Glue the beak on using the glue stick. Now’s the time to pull out that hot glue gun and get to the real business. This is also the part where the adults need to step in. Using the hot glue, add the googly eyes to the top of the beak. Finally, hot glue the base to the owl, I used foamy hearts from the Dollar Store. They came in red, white, and pink and were guaranteed to coordinate with our owls, plus, the bumps of the heart resembled feet on our finished owls! 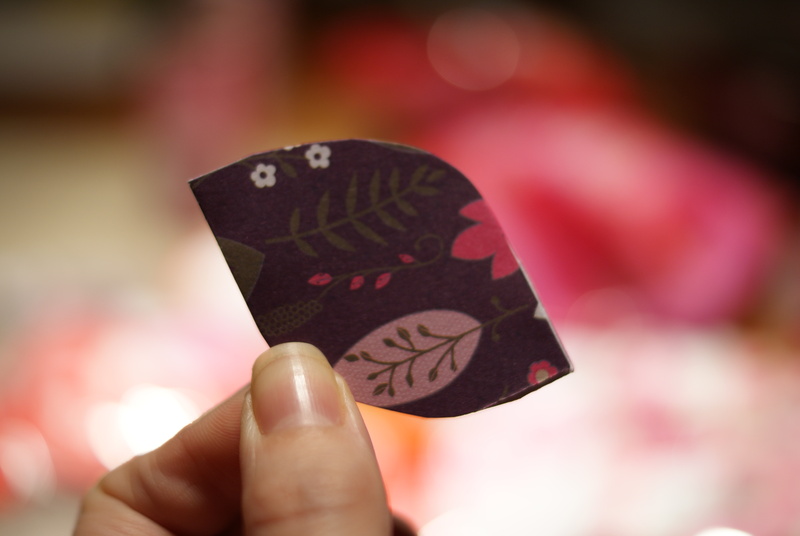 You can use cardstock, or even a couple strips of tape. 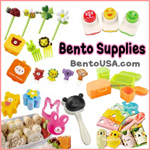 Finally, stuff the completed owls with candy, and fold down the tops to make the ears. Add a to: and from: spot on the back (we just did a from: spot as there wasn’t a ton of room left), and you’re done! Their only complaint is that Valentine’s Day isn’t tomorrow! 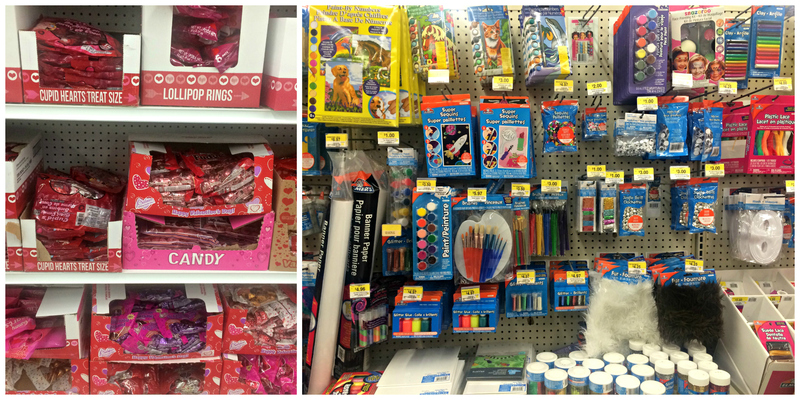 What kind of Valentine’s Day craft/card are your kids giving out this year? This shop has been compensated by Collective Bias, Inc. and its advertiser. All opinions are mine alone. #CollectiveBias.